Paper Can’t Protect Your Personal InformationBut Your Shredder Can! So you’ve heard all the buzz about switching from paper filing to electronic filing and you want to try it. Sounds simple enough. Transfer all of the information from your filing cabinet over to your new laptop and toss all the junk to the curb, right? Wrong! Secure document storage on a computer or in a database is one thing, but paper shredding is an absolute must when transferring any type of important personal information from page to the screen. But why should I have to worry about that? It costs business owners and private homeowners an estimated $24 billion every year in information theft, and with paper being the most common material in solid waste around the world, that information is pretty easy to get to. But I don’t have a shredder! Fear not! Paper shredding services are available in nearly every office supply store in the world. 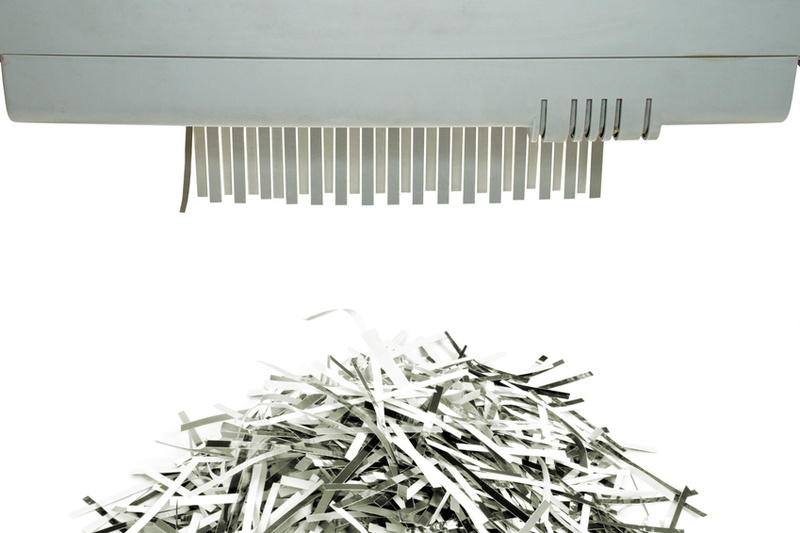 Most of the time they will charge a small fee, but free document shredding services are also available. Not only that, but most office spaces (including the one you probably work in) offer onsite shredding services right in the building! On the off chance that they don’t, an at-home paper shredder isn’t very expensive at all. In fact, shredding documents that contain sensitive information in the privacy of your own home may be preferable since you will be in total control of where and how the waste is handled. But I just want to switch computers! Even when switching computers, secure document storage must be taken into account. So all of your files have been moved or copied from one hard drive to another, but even then there are pieces of personal information stored on your old device. Old passwords, online account information, cookies, you name it and it’s probably still lurking about. If you want to sell your old device, or even just make sure nobody can access your information, hard drive destruction services are available to you. These services will ensure that all of the information on your hard drive is no longer accessible to anyone. How do I know what documents can be destroyed? If you have any personal information that contains old credit card numbers, bank account numbers, or any type of financial information that you no longer need for immediate documentation, it can be destroyed. Things such as old billing statements and receipts can be destroyed as well. Don’t risk the theft of your personal information!